The Ideal Pet Products Designer Series Ruff-Weather Wall-Kit is designed exclusively for use with the Ideal Pet Products Designer Series Ruff-Weather Pet Door. 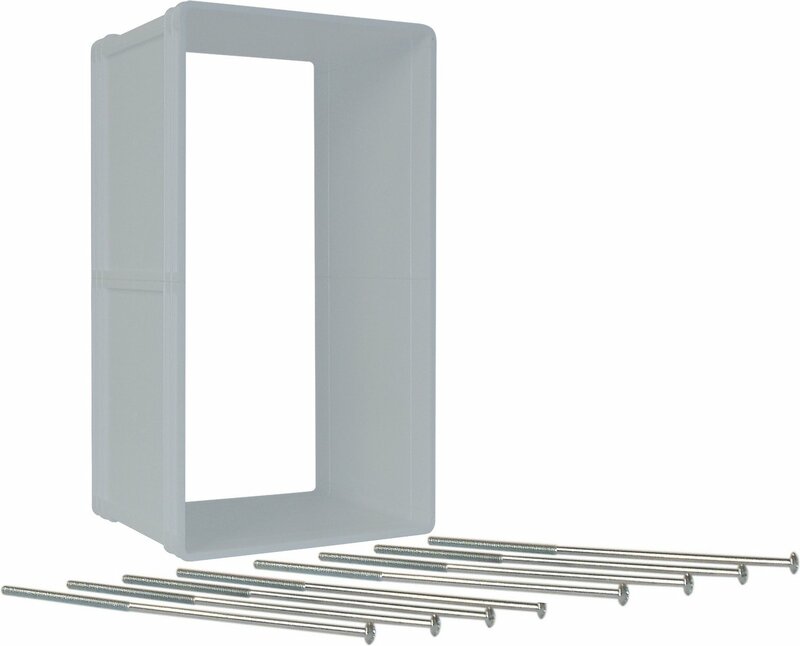 This wall kit allows you to easily install your new Designer Series Ruff-Weather Pet Door into a wall from 4 and 3/4 inches to 7 and 1/4 inches thick. Best of all, it can be used in either interior or exterior walls. Each kit comes with everything you need, from easy-to-follow instructions to all the hardware included. Allows your Designer Series Ruff Weather Pet Door to be installed through an exterior or interior wall. Eliminates the hassle and guesswork of wall installation with easy to follow instructions. All the hardware comes included with every purchase, so you’ll have everything you need. Comes in various sizes, so you can find the one that best suits your needs. All Ideal Pet Products feature a one-year warranty, so you can purchase with confidence. Whenever drilling and cutting through walls, extreme caution should always be taken to avoid gas, electric and plumbing lines. Designed exclusively for use with the Ideal Pet Products Ruff-Weather Pet Door. To determine the correct size door simply measure the width and height of your pet. Width: Measure the widest point of your pet's shoulder. Height: Measure from the top of your pets back (just behind his head) to the bottom of the chest. This is where online shopping has pitfalls. Had I been able to actually see and feel this product, I would not have purchased it. The best way to describe it in a word is cheap. I did not have time to send it back or I would have. In addition, it took a professional licensed contractor to install it (with dog door}. I will choose only products I know from here on out. Works well with the compatible pet door. Quite a pain to snap off the plastic to fit the wall width and more of a pain to cut the screws, but am very pleased with the final product. did not work with the ideal pet small door kit. The doggie door was installed into a wall in a professional easy manner. Price was excellent an as usual was shipped quickly thru chewy. I had to have a handyman install and it did take some time! (and money) but totally worth the convenience. Got got a handyman to put in my new larger doggie door. Had to buy the additional insert but it looks so much better. The doggie door came with two clear flaps that will not allow all the heat or cool to escape. I needed to buy longer screws because of my wall thickness. I am so very happy with the product both the doggie door and the insert. Size of frame was not even close to the size of the door. We are currently making a custom frame out of wood. Terrible design flaw.